17-year-old Emmanuel thoughtfully writes on his notebook as his teacher supplements the lesson with detailed explanation. Today, they are discussing about the factors affecting businesses. 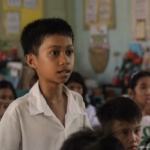 Emmanuel is an active student leader in school and he strives hard in the hopes of becoming a lawyer someday. He dreams of providing for his family and helping people in need. Emmanuel, a sponsored child for seven years, lives in a community in Isabela with his father and younger brother. His mother is an Overseas Filipino Worker (OFW) who was home for Christmas last year after spending two years in Hong Kong. 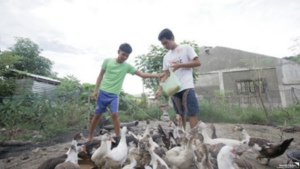 His father earns for the family by doing odd jobs and working for their church. Although one of his parents is working abroad, life is still not easy for them. Emmanuel shared how hard it is to not always have a mother figure. Although he knows that his mother needs to sacrifice being away from their family to provide for them and keep him and his brother in school, Emmanuel wishes his mom is with them especially on special occasions like Christmas. “Ang importante is yung essence ng Christmas. Yung tipong kahit gaano ka-minimal or simple yung handa namin ay sabay-sabay kaming kakain. Yung tipong kahit gaano ka katulog ay talagang gigisingin ka nila para lang i-celebrate yung Noche Buena tsaka yung pagsalubong sa Pasko (What’s important is the essence of Christmas. No matter how minimal or simple the celebration is, we all have to eat together. Even when I’m already asleep, my family would wake me up just so we can celebrate Noche Buena and welcome Christmas together),” Emmanuel shares. His favorite Christmas memory is seeing his family—mother, father and younger brother—celebrating Christmas together, sharing a simple feast on Christmas Eve. This is the experience we hope to give not only to Emmanuel but also to other children under our care. In 2005, World Vision launched its Noche Buena Campaign which aims to provide children and their families with a simple Christmas celebration. 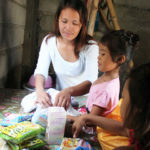 Every Noche Buena gift which includes children’s favorites like spaghetti, fruit cocktails, and other canned good delights, is hoped to remind children and families about God’s love and goodness to all of us. This Christmas, Emmanuel wishes he can celebrate it with his mother who just flew to Taiwan early this year to work. But even when she cannot come home at this time, he is happy to spend this season with his father and brother sitting around a table, sharing a meaningful meal together in celebration of Jesus’ birth.